A wonderful dream story inspired this painting. 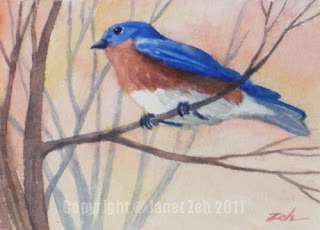 I've been asking for suggestions for my bird series on Facebook as well as here. One person wrote that many years ago, she had a dream that a bluebird was flying over her right shoulder as she walked down a street. She said it marked a turning point in her life. Ever since, bluebirds have been her favorite bird. Bluebirds are a symbol of happiness and good fortune. It's appropriate that a bluebird should mark a new beginning. So I've painted this piece with the glow of dawn just coming up, turning the sky a soft pink hue and named it "A New Day."